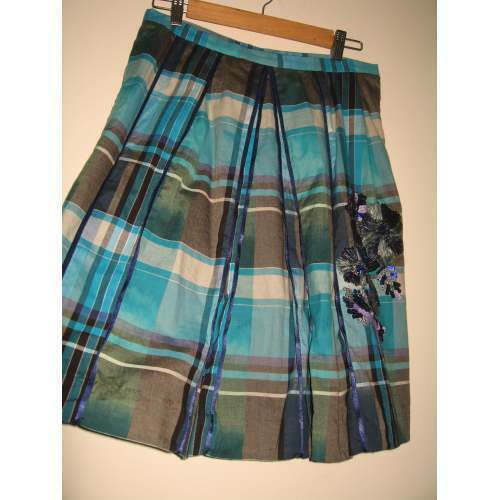 We provide a winsome range of Ladies Skirts, That are available in various attractive patterns like floral, round, stripe etc and vibrant colors. These skirts are paired with top, shirt and other outfits. The attire can be tied around the waist with charming belts or strings. We provide the range at most economical prices. Backed by an experience of more than three decades, we have been engaged in manufacturing and exporting a wide range of Fashion Wear Garments for ladies. Our product range includes Women Dresses, Ladies Skirts, Night Wears and Blouses in varied styles, colours and patterns. These garments are widely acknowledged by our clients for their colour fastness, fine stitching and neat finish. Made in exquisite styles and designs, our range if garments have made us one of the leading manufacturers in this segment. To design these garments, we have with us a team of creative craftsmen and designers who have a rich experience in this domain. Our designers work the year round to come up with designs which are appreciated by our clients in India and abroad. We have with us, tailors who have an eye for neat stitching, thereby proving the garments with a smooth finish. Our infrastructure is equipped with state of the art machines which enable in manufacturing a splendid range of garments.